Bonn, 15 November 2017: Leaders from business, civil society, Government and the United Nations convened in Bonn to discuss an accelerated pathway forward towards implementing the Paris Climate Agreement and the Sustainable Development Goals (SDGs) at the COP 23/CMP 13: High-Level Meeting of Caring for Climate. Jointly hosted by the UN Global Compact, UN Environment Programme and the UN Framework Convention on Climate Change secretariat, the meeting served as a high-level stakeholder consultation — with a focus on business engagement — to inform the process leading up to the UN Secretary-General’s Climate Summit to be held in 2019. The day also saw the release of the Global Climate Action Playbook 2018, which equips business with a set of policy updates, tools and analysis to enhance Nationally Determined Contributions (NDCs) and the SDGs. Launched by the UN Global Compact together with its partners, including the World Resources Institute, the Playbook is designed to help business and Governments work together to enhance country level ambition and action to implement the Paris Agreement leading up to 2020. Expansion in geothermal, solar and wind energy production, other renewables and clean energy options. Enhancement of Energy and resource efficiency across the different sectors. Make progress towards achieving a tree cover of at least 10% of the land area of Kenya. Clean energy technologies to reduce over - reliance on wood fuels. Low carbon and efficient transportation systems. Climate smart agriculture (CSA) in line with the National CSA Framework. 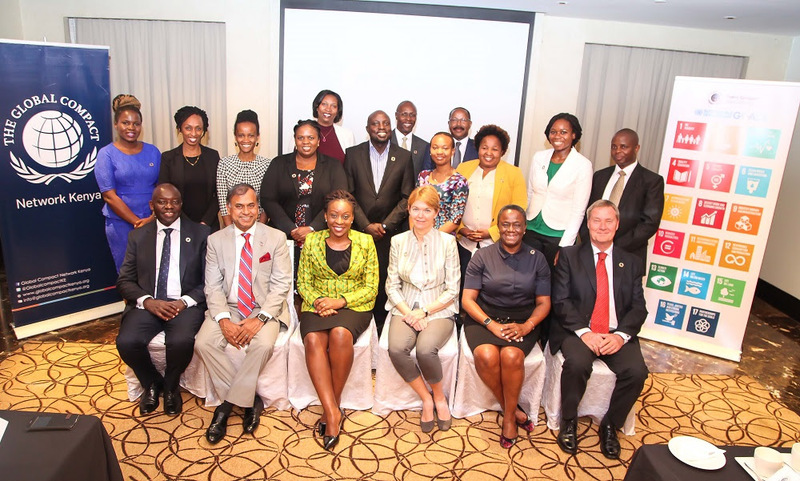 9th November, 2017, Nairobi: UN Global Compact CEO and Executive Director Ms. Lise Kingo hosted a CEO’s Dialogue with business leaders in Kenya on the Sustainable Development Goals (SDGs), to identify untapped opportunities for companies to deliver accelerated impact on the SDGs. 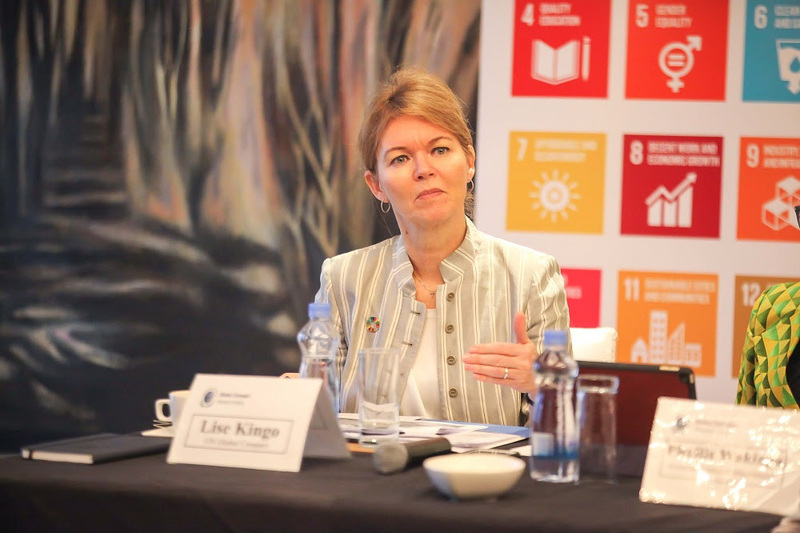 Speaking during the event Ms. Lise Kingo called on business to implement the SDGs and look at the global goals as a way of turning risks into opportunities. “The SDGs present 1.1 trillion US dollars potential for business in Africa and creation of up to 85 Million new jobs. There is so much that business can do to implement the SDGs,” said Ms. Kingo. The SDGs launched in 2015 seek to end poverty, protect the planet and ensure prosperity for all. They call on companies everywhere to advance sustainable development through the investments they make, the solutions they develop, and the business practices they adopt. A survey conducted by the United Nations Global Compact targeting over nine thousand participating companies worldwide reveals that 85% of African companies are already taking action on the SDGs. With key focus on SDG 8 to provide decent work and economic growth, SDG 5 to achieve gender equality and SDG 3 to provide good health and promote well being. Globally, sustainability is gaining strategic ground and Africa as the hub of innovation and entrepreneurship is expected to play a key role in delivering on the global goals. 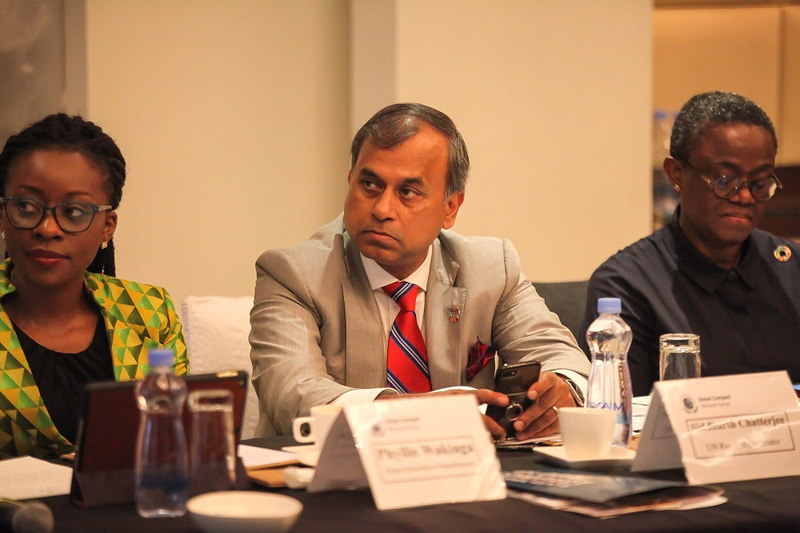 Speaking at the session, the Kenya UN Resident Coordinator Siddharth Chatterjee pointed out that the main movers of an economy are access to health and basic education. “Health & Agribusiness are the two turning points to deliver the world we want in Africa & in Kenya. These two are sectors are expected to provide the greatest potential for Socio-economic transformation.” He added. 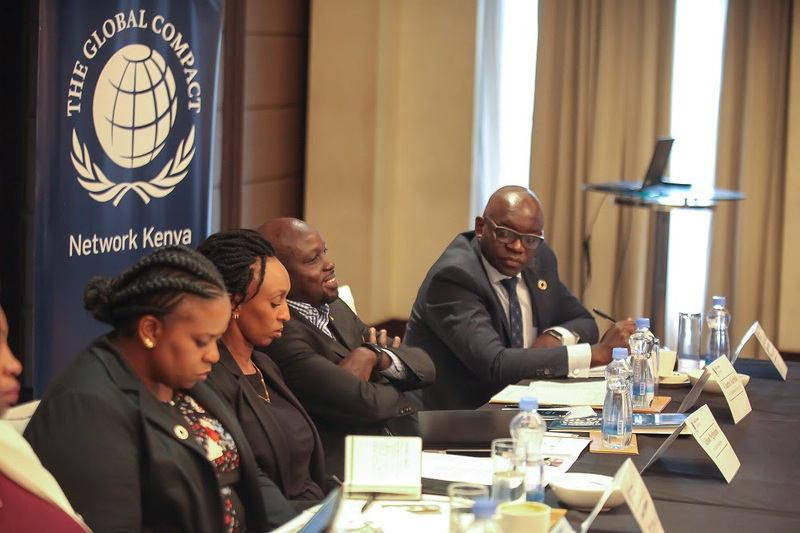 Speaking during the dialogue, the Global Compact Kenya Network Representative and Kenya Association of Manufacturers Chief Executive Ms. Phyllis Wakiaga noted that Kenya possesses numerous untapped opportunities in reference to the SDGs. “This dialogue session seeks to explore opportunities to deliver accelerated impact on the SDGs. We’re glad to see that our members have identified and continue to implement the goals, we will continue to build their capacity and we call on other businesses to implement the goals,” added Ms. Wakiaga. 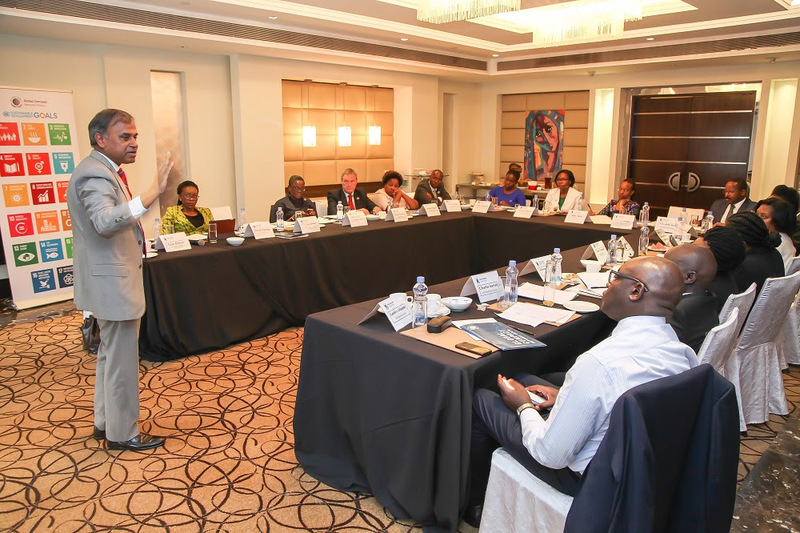 Kenya currently has over 700 signatory companies committing to responsible and sustainable business practice and will require a national movement to deliver transformative change. The event drew participants from various sectors such as healthcare, manufacturing, telecommunications and the service sector. The participants shared their companies' implementation of the SDGs, with key goals being: SDG 3 to provide Good health and ensure well being for all, SDG 5 to achieve gender equality, SDG 7 to provide affordable and clean energy, SDG 8 to promote sustainable economic growth and decent work, SDG 13 to take urgent action to combat climate change and its impacts, SDG 15 on Life on Land. The Sustainable Development Goals (SDGs) define global sustainable development priorities and aspirations for 2030 and seek to mobilize global efforts around a common set of goals and targets. The SDGs call for worldwide action among governments, business and the civil society to end poverty and create a life of dignity and opportunity for all, within the boundaries of the planet. The SDGs explicitly call on all businesses to apply their creativity and innovation to solve sustainable development challenges. Solving these challenges also presents an opportunity for business-led solutions and technologies to be developed and implemented to help achieve the goals. In this regard, Global Compact Network Kenya in its mission to mobilize business action for the SDGs calls on its members to share their implementation journeys. We will share the good practices through an SDGs company spotlight series. The case studies will also be circulated widely to our local database of over 5000 Kenyan companies, global network of partners and throughout our social media platforms namely Facebook, Twitter, LinkedIn and YouTube. Next steps towards the implementation of SDGs.